This month's image shows a group of Paramecium, one of the larger protozoa or single-celled animals which can attain a size of 300um. 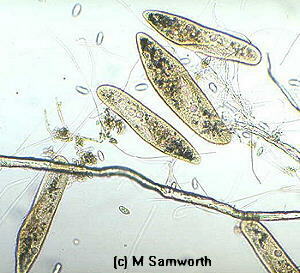 It is fairly common in freshwater habitats and is commonly used as a textbook example of a ciliated protozoa. A detailed article on Paramecium illustrated with photomicrographs and diagrams to show the structure is available in the Micscape Library. Image taken by Mike Samworth, one of the regular contributors to Micscape magazine. Notes by David Walker. Comments to the author Comments to the author sent via our contacts page quoting page url plus : ('msamworth','')">Mike Samworth welcomed.